Uber: Who has not heard of it? This is the most popular on-demand cab service app which has brought a revolution in daily transportation ways. It simply uses your GPS to connect you to the nearest available driver, where the driver comes to pick you literally on your location and drop comfortably wherever you ask him to do. The payment modes here are easy and modern and the fares are also pretty clear and calculated before. So, whenever your car has gone for service or you don’t want to drive in traffic, simply call an Uber and enjoy your ride. Grofers: It is an on-demand delivery service app which picks up stuff from the nearby store and delivers them within a time limit. You can place a request for grocery, staples, meat, dairy, fruit, vegetables, medicines, bakery and etc and will get it delivered at your doorsteps. The app is a boon for all the people who are busy with their jobs from Monday to Saturday and don’t feel like leaving their homes on Sunday. Bloom That- Flower delivery: Flowers are the most convenient thing to take to any occasion. The fresh they are, the beautiful they look to give to anybody. So, instead of going to a shop and buying flowers ahead of your occasion, it is better to use this app and get the flowers delivered just in time before the occasion. You can open the app choose the flowers you like, make the payment and Bloom That will source them locally to deliver right at your door. FlyCleaners- Laundry and dry cleaning delivery: After an entire busy week, doing laundry and going to dry cleaners can be really irritating. Flycleaners aim to simplify this household chores of yours by bringing in its app where just on the tap of mobile you get premium quality cleaning. You just have to select the time for the ‘FlyGuy’ to come and pick the clothes and you will be notified once the clothes are clean and are on your way back home, dropped by them. Priv: Another app which provides its users with a broad variety of health and wellness services. Here, you can hire a specialist for an elegant hairstyle, delicate manicure or refreshing massage as per your convenience. You can even hold fitness sessions at your home or office using this app. Recently Priv started with a new range of services like beard and moustache shaving, straight shaving and etc for males. Wait, the services and convenience through apps don’t stop here. 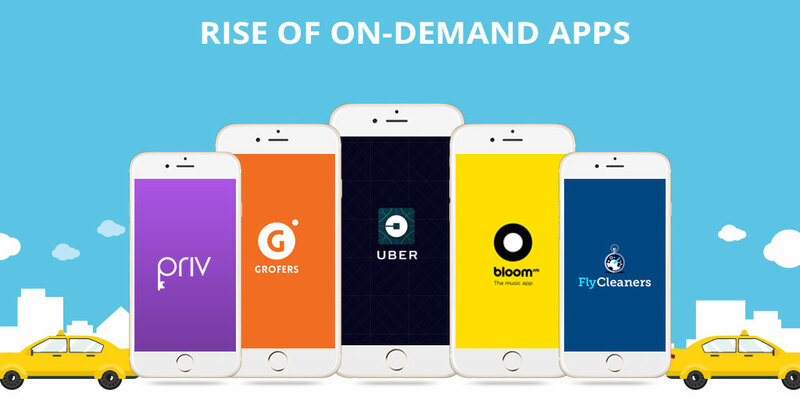 Besides all these, you have on-demand apps for food delivery, pet sitting, babysitting, massages and hiring electricians, plumbers, or carpenters. Many of them are not available in India as of date but will soon come seeing the behaviour of modern customers and the scope of growth with it.